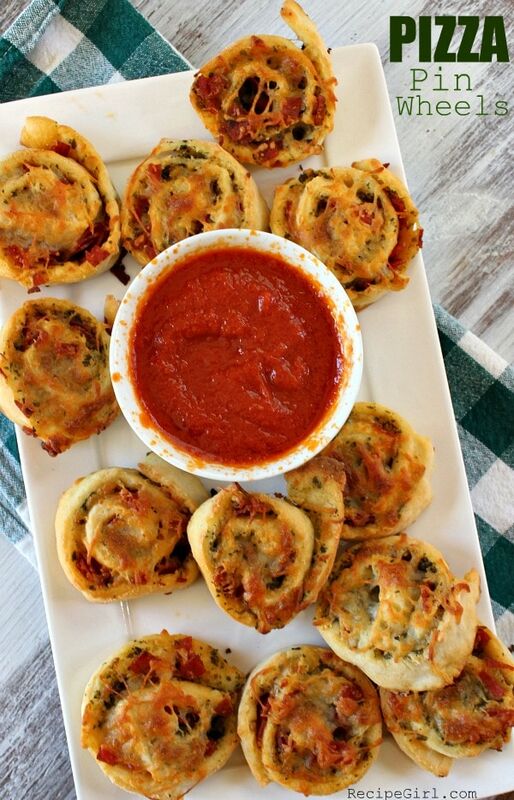 Pizza Pinwheels are a delicious appetizer of pesto sauce, cheese and pepperoni rolled up in a simple pizza dough and baked until melted and crispy. 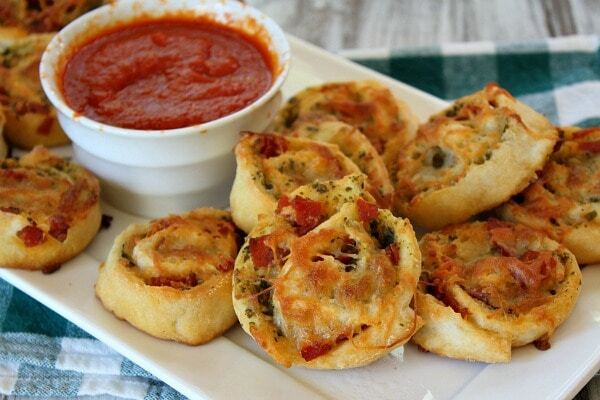 These Pizza Pinwheels are served with a side of pizza sauce for dipping. 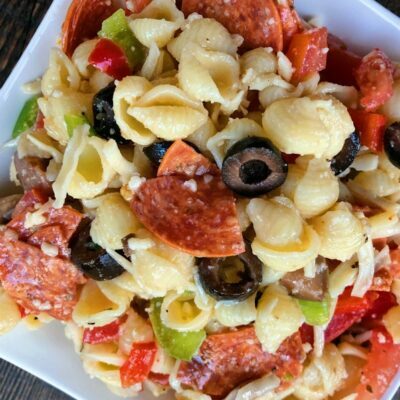 Watch the video showing you how to make this recipe, then scroll to the bottom of this post and print out the recipe so you can make it at home. Time for a new party recipe! 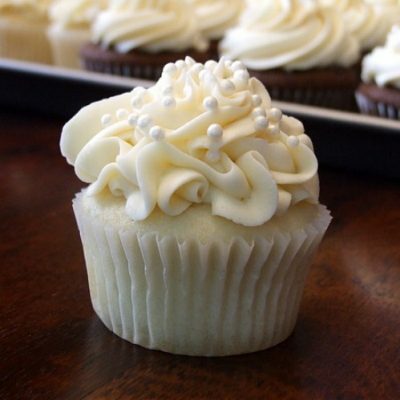 The best part about party recipes is that you can enjoy them along with your guests. Or you can do what my husband does and be so much of a social butterfly that you don’t actually get around to eating anything. I don’t recommend that! I’m able to do both. I love to have friends over for wine and appetizers, and somehow I manage to enjoy my food and drink and still visit with friends. 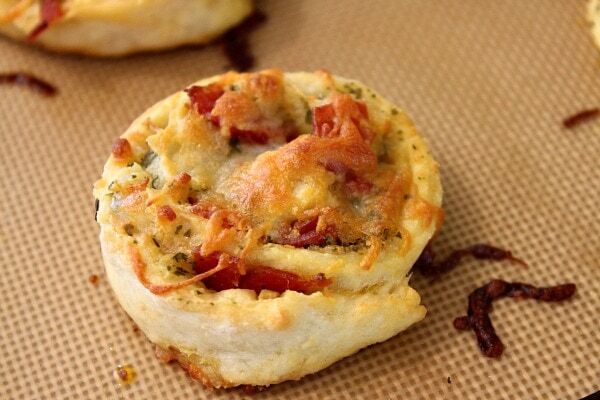 These Pizza Pinwheels are great because you can make them ahead and just pop them in the oven when you’re ready for them to be baked and served. 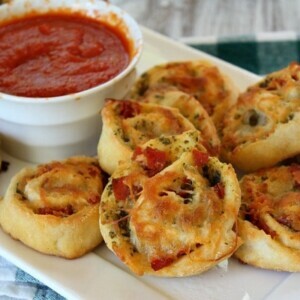 The inspiration for these Pizza Pinwheels comes from the idea of starting with a very basic dough made with just two ingredients. People have been using this dough all over the internet for making pizza dough, bagels, breadsticks and more! It’s a fun dough to play around with and create new recipes. The two ingredients in question are Self-Rising Flour and Greek Yogurt. 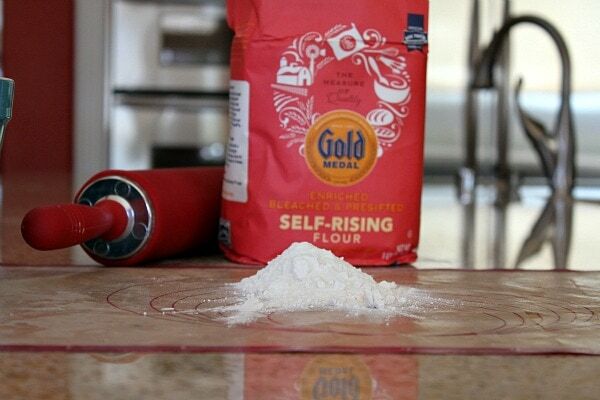 If you don’t happen to have self-rising flour, here’s an easy way to make your own self-rising flour. I understand not wanting to buy a whole bag of it when you don’t know if you’ll be able to use it all. I’d definitely not recommend using a nonfat version of Greek yogurt as you want the yogurt to be on the thick side of things. Nonfat yogurt may change the flour to yogurt ratio and create a dough that is wetter than you want. 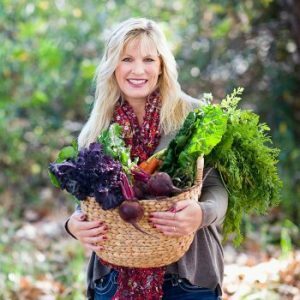 I use 2% Plain Greek yogurt for this recipe. Just mix the self-rising flour and Greek yogurt together (in my recipe I have added a tiny bit of sugar too), and then roll it out onto a floured mat. 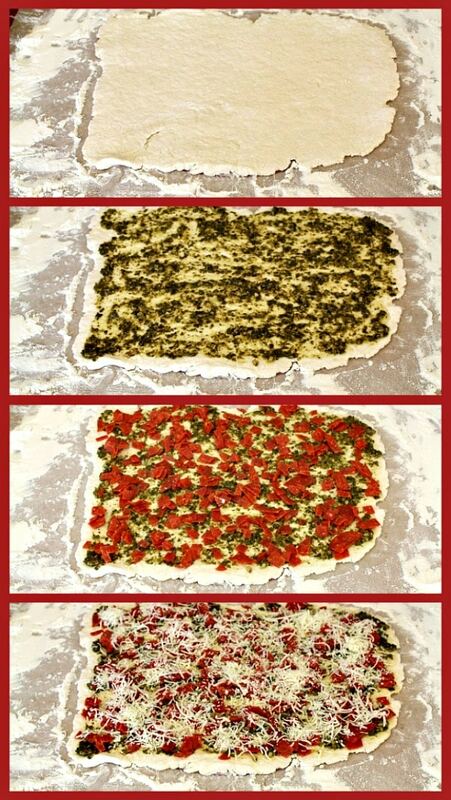 I top mine with pesto sauce, pepperoni, and an Italian cheese blend. Roll it up all snuggly. Carefully slice, and you’ll end up with about 16 sliced rolls. 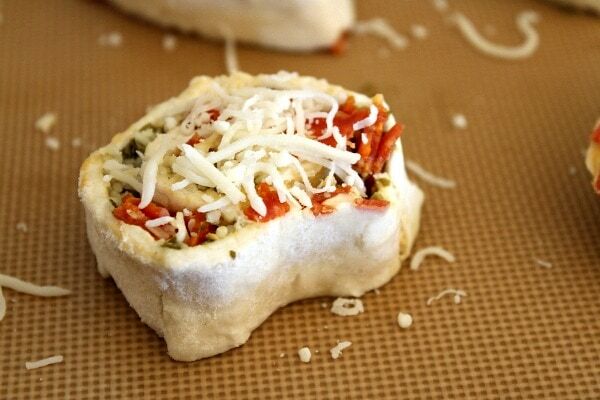 Top each roll with a little bit more cheese blend. Bake for 20 minutes. 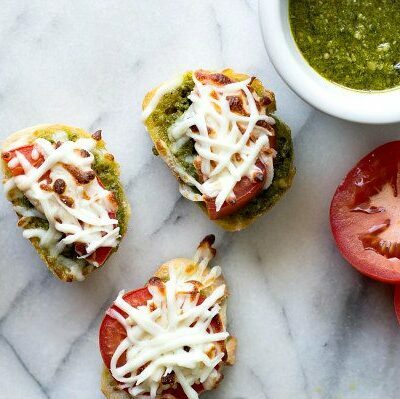 Serve with pizza sauce or a very smooth marinara sauce for dipping. 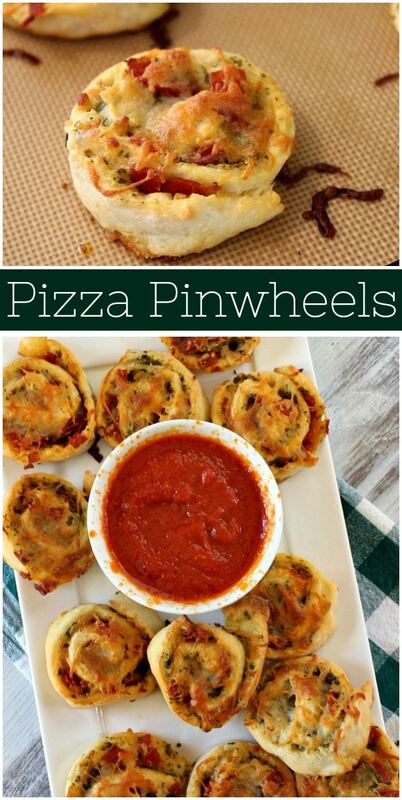 These Pizza Pinwheels make for great party food! These are a nice little treat for any old time. 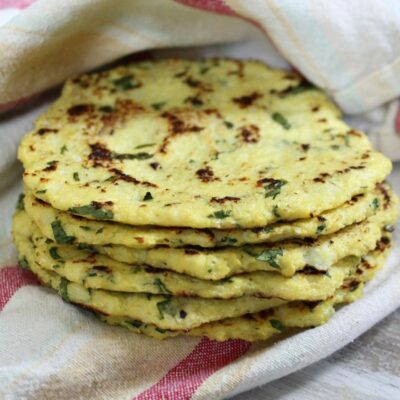 I happened to make them during the day last week and they made for a great after-school snack. The possibilities are endless for trying different fillings too. Maybe even a sweet cinnamon-roll-like version? I can’t wait to try that! 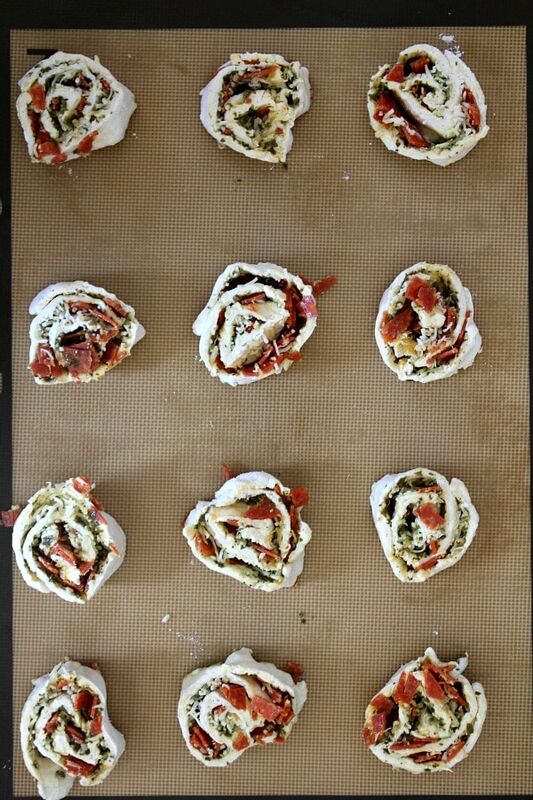 Love these easy baked Pizza Pinwheels! Preheat the oven to 350 degrees F. Line a baking sheet with parchment paper or a silpat mat (or spray with nonstick spray). In a medium bowl, whisk together the flour, sugar and salt. Mix in the yogurt and continue to stir and mix until the ingredients are well-combined and forming a dough. Turn out the dough onto a well-floured surface. Knead a bit until the dough comes together well, sprinkling in more flour if needed. Roll the dough into a rectangle (about 9x14-inches). 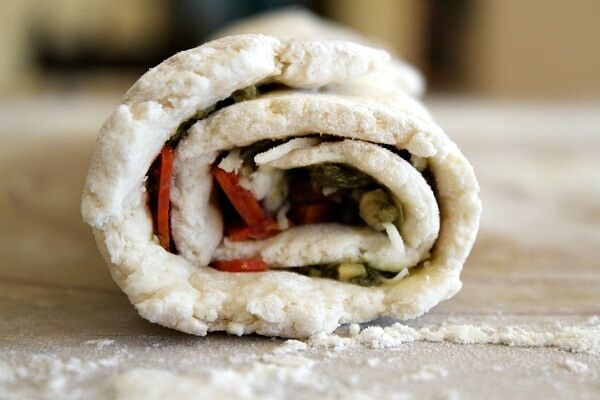 Spoon the pesto onto the rolled out dough, using the bottom of a spoon to spread it out evenly. Sprinkle with the chopped pepperoni. 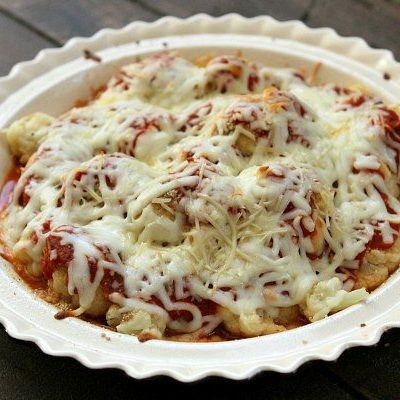 Top with 1/2 cup cheese. Carefully roll up the dough into a log. It will be a little soft and precarious. Use a sharp knife to cut about 1/2-inch slices. Hold the sliced roll together with your fingers while you transfer it to the prepared baking sheet. Repeat with the remaining slices. Bake 20 minutes, or until cooked through and lightly browned. Serve warm with sauce. To make your own self-rising flour: Whisk together 1 cup of all purpose flour with 1 1/2 teaspoons of baking powder and 1/4 teaspoon of salt. Whisk well, so the ingredients are evenly incorporated. *I used Fage brand 2% Greek yogurt. If you use a different brand or a different fat content, you may need to use either more or less yogurt because the moisture content may vary. I'd measure out 2/3 cup, then mix about 1/2 cup into the flour. Then add more as needed until a nice, non-sticky dough is formed. Nutritional information does not include sauce. This recipe was originally created in partnership with Gold Medal Flour. I’m not sure since I’ve never tried making these ahead! Has anyone ever made this the night before and chilled it for morning? I was hoping to use this recipe for the dough to make breakfast pizzas.. I haven’t… let me know if you have success with it! So you start by saying its a 2-ingredient dough but then following it says add salt and sugar. So can I not use the salt and sugar or should I? Thanks! These look yummy. 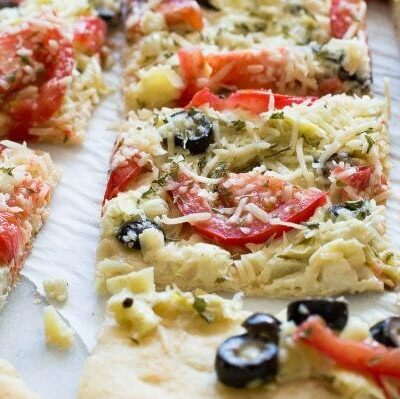 It comes from the idea of a two-ingredient pizza dough recipe… but follow this recipe as directed- which is more than two ingredients. 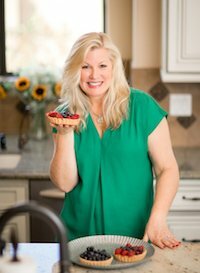 Lori, thank you for giving me a new Super bowl Snack recipe! Go San Francisco!!!! Will be eating these for sure and rooting for the 49’ers!! These look so good! All of my friends rave about greek yogurt but I have never bought it. I would be willing, however, to try it with this recipe! Can these be made ahead and warmed up the next day?